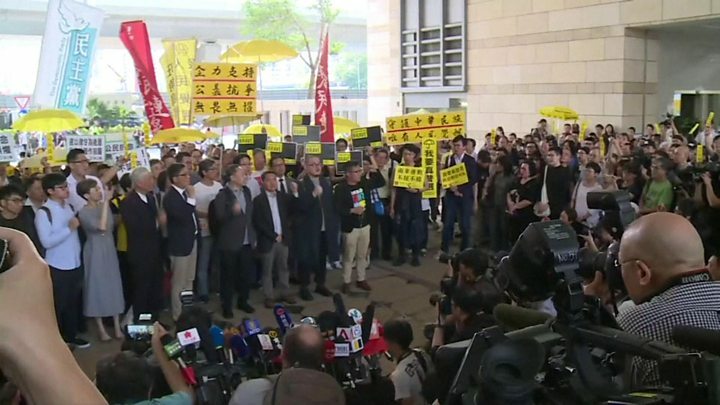 Delivering his verdict, Justice Johnny Chan said the defendants had caused a nuisance - by occupying major roads - leading to injuries among civilians. The nine looked calm and not particularly emotional. They were later released on bail. Benny Tai, Chan Kin-man and Chu Yiu-ming smiled as they passed me, as if it was just another day. Image caption One pro-democracy supporter outside the court held up a sign saying "People's Hero"